We CAN and WILL guarantee to you in writing both an exact price and guaranteed sale! Don't risk locking yourself into a contract with an auction house where they cannot and will not guarantee you a sale or the sales price for your antique Tiffany lamp. Don't sell to a dealer who will give you less money for your antique Tiffany lamp to help cover their very high overhead and other expenses. 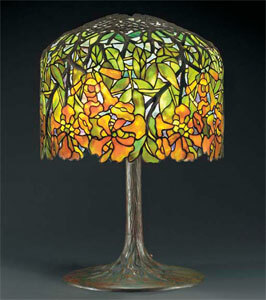 We are private, expert "brokers" (selling on behalf of the owners) of Tiffany Studios lamps. 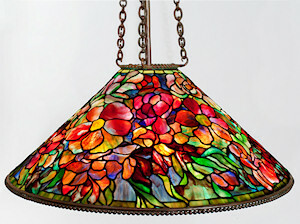 We maintain a large list of private collectors/buyers who are actively seeking signed and authenticated genuine Tiffany Studios lamps of any size and style; including hanging shades, table lamps, floor lamps, desk lamps, chandeliers, signed Tiffany bronze lamp bases (must be signed and numbered on the bottom of the base), and authentic, signed Tiffany lamp shades in excellent condition. For more information on authentic Tiffany lamps, with some representative examples of the various types, patterns, shapes, signature marks and other guidelines to show you what we are seeking on behalf of our buyers/collectors, we invite you to view our "Lamp Images" and "Lamp Facts" pages. The largest costs to the seller-owner when selling at auction or through a nice gallery are the "fees and commissions" they must pay to the auction house or gallery owner for selling their lamp (s). These fees quite often total between 20 - 40% of the actual sale price, leaving the consignor with much less money than they had hoped. We feel that since all buyers would have to pay a commission if they bought at any major auction house, or indirectly pay more if they bought from a consignment gallery, we will, as a broker, simply charge them a "finder's fee" commission, and put none of the costs or commissions onto the lamp owner. We discreetly present your lamp (s) to private collectors who are only interested in buying a vetted, authenticated Tiffany lamp they know is not a forgery and which has no serious condition problems that are not disclosed. For more information regarding our brokerage services, and how it works, please read our "Broker Services" page. There are numerous risks involved in attempting to sell an authentic Tiffany lamp on your own. Making sure it is truly authentic and not a very good forgery is a very important issue. Pricing it right (not too high or too low) is another. Over exposure, or "shopping an lamp around," to dealers, auction houses and "online" can have the most detrimental effects on the ultimate ability to sell a Tiffany lamp and/or to sell it for the price it should be worth. We are professionals with over 42 years of experience, specializing in the evaluation and private brokering of authentic, antique Tiffany lamps made by Louis C. Tiffany between c.1898-1928. Our company is discreet, and has a ready list of collectors/buyers eager to purchase authentic L.C. Tiffany lamps of all kinds. 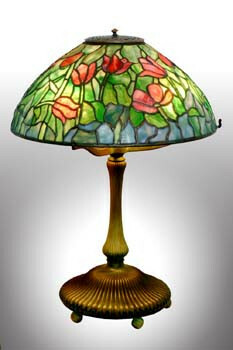 Please complete our simple online Tiffany lamp "Evaluation Form" and submit it to us in email. You will be instructed on how to send photos after you submit the form.